Why should we eat beef? What breed of pig is best suited to make sausages? There is no particular breed of pig that makes better sausages than another pig breed. In this regard, all pigs are equal. What is not equal is the cut of meat used to make sausages. The best cuts for sausage making are medium lean to fat. These cuts come from the pork neck, side of pork and pork shoulder. Why is packaged beef a different colour on the outside than on the inside? 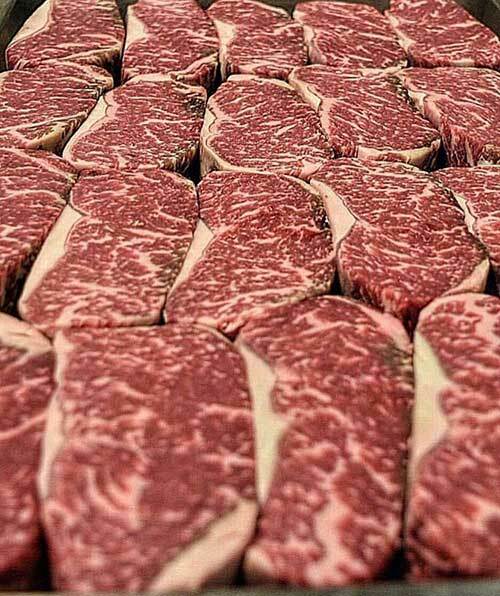 The pigment that makes the meat dark red reacts to the oxygen in the air through the permeable plastic wrap and becomes bright red. The interior stays dark due to lack of oxygen. Beef is aged to add characteristic flavour and increase tenderness. In the “dry aging” process, beef is held at temperatures from 3 Celcius to 4 Celicus (34F to 38F) for 10 days to 28 days. Read full information on aging beef and venison. Slowly brown steak on all sides in a small amount of olive oil in a heavy pan. Add small amount, 1/2-to2 cubs, liquid to pan. Bring to a boil; reduce heat. -Cover tightly and simmer gently over low heat on top of range, or in a preheated 325F oven until beef is fork-tender.